Otto Hutt uses very simple, minimal branding on their pens, and I find their matte finish both gorgeous and comfortable to hold. Germany has several high-end pen companies whose products rarely make it to this side of the Atlantic, and if they do, they are imported in such small quantities that they are difficult to find and rarely reviewed online. Retailers who stock some of these brands don't promote them heavily. I'm talking about brands like Otto Hutt, Cleo Skribent, Diplomat, and - until recent years - Kaweco, Faber-Castell and Graf von Faber-Castell. I was contacted a couple months ago by representatives of Pen Heaven, a UK-based online retailer, asking whether I would be interested in collaborating with them on a review. The design of the Otto Hutt pens intrigued me, and they agreed to send me one of the pens for review. Otto Hutt packaging is very functional, and somewhat similar to Lamy (though not as minimalist). There are no flashy wood or metal boxes, just cardboard/foam packaging that is sturdy enough to protect the pen while looking nice. As I mentioned, Otto Hutt is a German pen manufacturer based in Pforzheim, a town known for its jewelry. According to the Company's website, Otto Hutt has been in business since the 1920s, and originally specialized in writing implements made from silver. The current Otto Hutt lineup features seven fountain pens ("Design 01" through "Design 07"), along with ballpoint and rollerball offerings. The pen I'm reviewing here is "Design 06", which is one step below the "flagship" of the Otto Hutt line, the "Design 07." I found the detailing on this nib really attractive. I like the understated Otto Hutt logo. The nib is the star of the show here. Otto Hutt uses nibs said to be manufactured by Peter Bock AG, which are stamped with the Otto Hutt logo. The nib on my pen is exceptionally smooth, and even has a bit of softness to it. Normally, there's no mistaking a steel nib for a gold nib, but this one could easily pass for a two-toned rhodium-plated gold nib. Even better, the alignment on the nib was perfect, and there were no variations in ink flow during multiple all-day writing sessions. The nib writes what I'd consider to be a "true medium" line. The pen's compact design and good balance helps offset the weight of the metal construction. The Design 06 sports a compact, Bauhaus-inspired design (per the Otto Hutt website), and I've enjoyed the classic matte black / chrome color scheme. The pen also comes in red and pink, with the pink pen featuring rose gold trim. The latter color combination is especially pretty. The finish and tolerances on this pen are top notch. The cap and body line up perfectly flush with each other, the pen has no rough edges, and the lacquer finish is flawless. All of these place my Otto Hutt a notch above pens I've used from Diplomat (or even Lamy). Perhaps my favorite thing about this pen is that the threads are cut so that it takes only a single turn to screw or unscrew the cap, which closes securely. The pen also has a spring-loaded clip, which easily attaches to a shirt pocket. Otto Hutt has its roots in metalworking, so this is a metal pen. The section is polished stainless steel, and has an hourglass-shape to prevent slippage. The body of the pen is also metal (probably brass or steel), and is coated in a thick matte lacquer. Unlike other metal pen bodies I've reviewed in the past - the Lamy Studio is the one that comes to mind - the matte black coating is thickly and evenly applied, so there appears to be little risk of it chipping or flaking off. I can't find a single flaw in the finish on the Design 06. I consider it a step up from pens like the Studio and the Diplomat Aero. While I like those models, I'm often able to find flaws (chips, flaking, scratches, etc.) in the finish of otherwise brand-new pens. Because it's metal, the Design 06 is a relatively heavy pen. But despite its heft, the pen is still very comfortable to use. 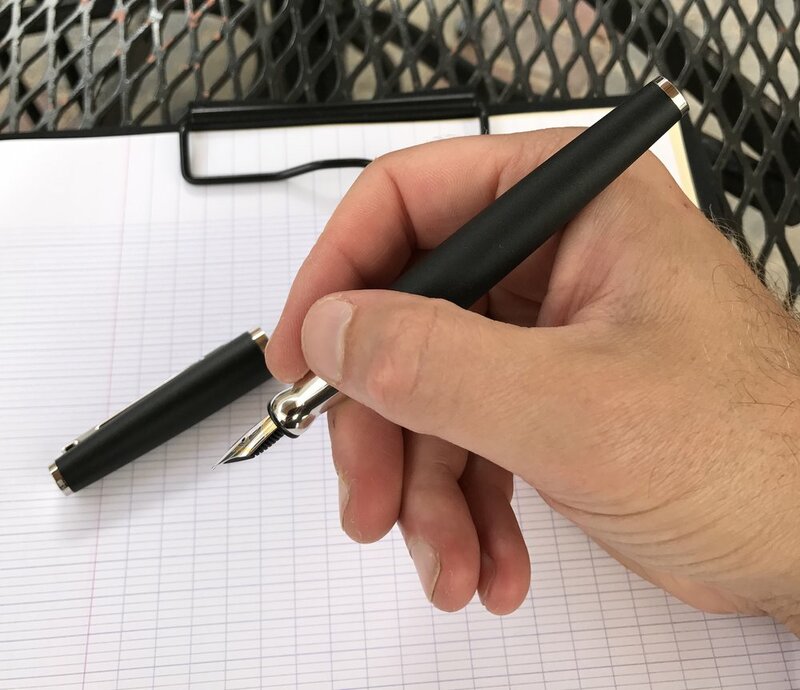 My review notes and initial draft of this post took me over an hour and spanned three handwritten pages (Clairefontaine French-ruled paper), yet I had no hand fatigue. I found the pen to be exceptionally well-balanced, even when posted. Otto Hutt pens featuring a steel nib are generally priced anywhere from $100-200, while gold-nibbed pens run in the $400-800 range. The pricing is fairly standard for German pens of this quality, and I would say that it's comparable to the pricing on Graf von Faber-Castell pens. Caran d'Ache is another pen company with a similar pricing structure, though CdA is based in Switzerland and not Germany. This pen is a big winner for me. Normally, I'm not a fan of steel-nibbed pens making their way north of the $130 mark, BUT I will make exceptions where the manufacturer clearly has put a significant amount of effort into making a nib both write exceptionally well and look good. That is certainly the case here, and this pen is as nice a writer as any gold nib pen that I own - out of the box and without any modifications, I might add. Otto Hutt pens are not cheap, but I'd be willing to pay the premium for quality. Given how good of an experience I had with the Design 06, I'm already looking to add another Otto Hutt pen to my collection. 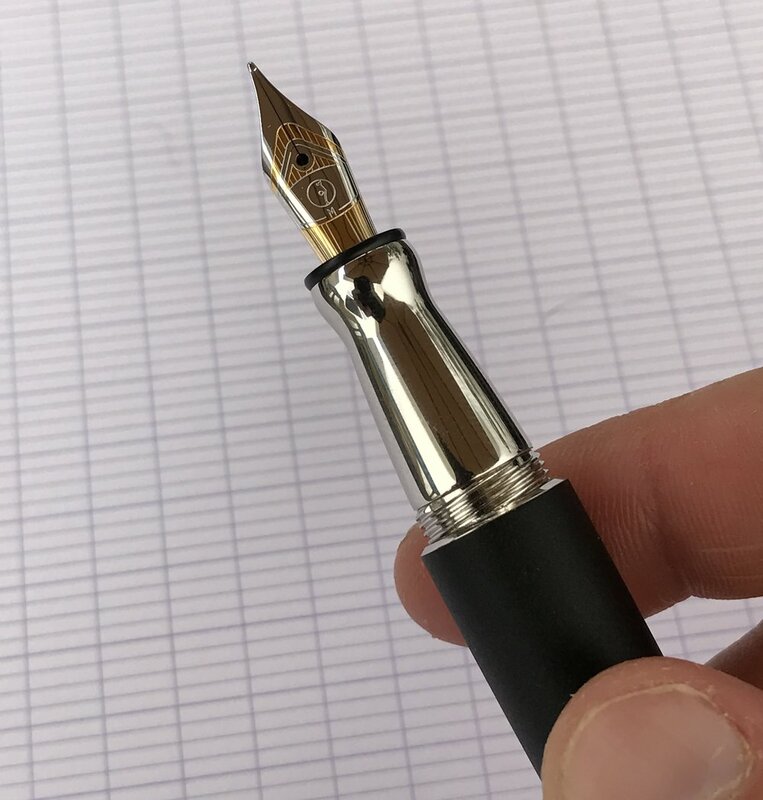 There is a bit of a "step-down" from the barrel to the section, but since I tend to grip my pen towards the front (i.e., at the nib-end of the section), the step didn't bother me. As a side note, I think I may be the first pen blogger to review an Otto Hutt pen! In case you haven't noticed, I was excited to write this review. 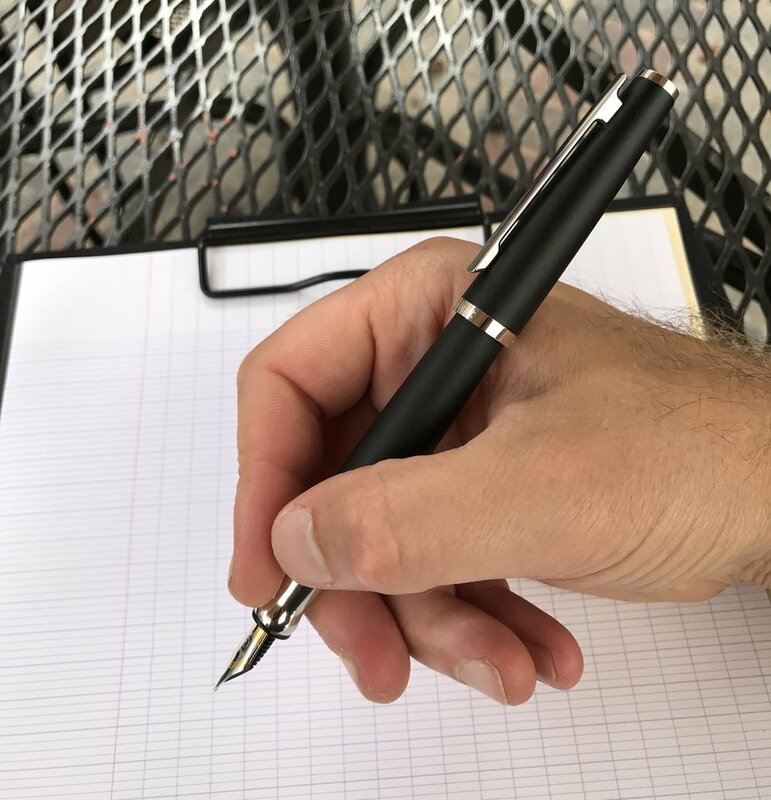 As fountain pens experience a bit of a "renaissance," and more and more people pay attention to pens online through blogs, forums, etc., it's increasingly rare to find lesser-known high-quality brands. Very few, if any, U.S.-based retailers carry the full Otto Hutt line. As I mentioned above, Pen Heaven, a UK-based retailer, graciously sent me this pen for review purposes. Pen Heaven stocks all of the various Otto Hutt models, along with pens from Faber-Castell, Graf von Faber-Castell, Lamy, Kaweco, Diplomat, and more. The pen arrived beautifully wrapped and packed, along with a personalized note, which is a touch that I always appreciate. If you're interested in ordering the same pen featured in this review (Otto Hutt Design 06), the link can be found here. Disclaimer: Pen Heaven provided me with this pen free of charge, for review purposes.